If you are anything like me, the cool in the air gets all the butterflies in your stomach going in anticipation for an exciting time of year – the holidays! I am normally a procrastinator of gift purchasing, but this year I am trying something different and trying to purchase gifts for our family early so I can spread out my spending over the next few weeks. Genius right? It’s taken how many years to figure this out? To help you stay ahead of the game as well, I have created the ultimate Christmas gift guide to get presents for your favorite bride! Hand selected with brides in mind, this gift guide will not only help them prepare for their upcoming wedding, but also help them build a beautiful marriage. Enjoy!! 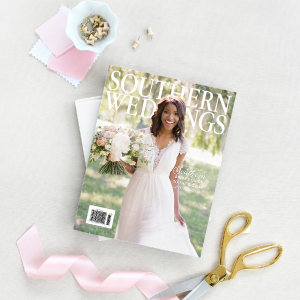 If I had to recommend the top two gifts for your favorite bride, the Southern Weddings Joyful Wedding Planner is definitely number one, but number two is this baby! The Promptly Love Story Journal is one of the most treasured things I own. In it, couples document not only their wedding day, but when they met, memories from when they were dating, memories from the proposal, and then…ya’ll…memories every year after. You can update it over the course of the year or pull it out on your wedding anniversary and update it then. These journals come in a set of two, one for him and one for her. They are such a special keepsake and would make a great stocking stuffer! This Yearly Prayer Journal is a great place to dig in and focus your prayer life in on what is most important to you and your family. This option includes a section for each month of 2018, as well as a few other goodies. This beautiful magazine is so much more than just a wedding magazine! You will find wedding inspiration as well as special tips for wedding planning and making not only your wedding beautiful, but your marriage focused and intentional. This prayer journal is similar to the Yearly Prayer Journal by the same company, but covers only 6 months at a time and is undated for you to fill out as you go. We are all on the go so much now. Work, family, friends, worship and repeat. Add in planning a wedding and it’s easy to see how you can you can lose track of time and even people! Just yesterday it was January 1st and now we’re planning for Christmas, it seems. While such a jammed packed schedule has become the way of life for most, it’s important that we don’t let our obligations keep us from those we love most, especially spouses or spouses-to-be. Date nights are more important than people realize. They help solidify the bond that you have created and allow time for you to remember each other as people and not just “husband/provider/protector” or “wife/helpmate/mom”. Now that you’ve decided on getting all dressed up and hitting the town, what’s there to do? Well, thankfully for those of us in Southwest Louisiana, there’s never a dull moment around here! There are lots of options for entertainment to fit just about any couple’s interests and budgets. One of the most wonderful things about Louisiana is the role art plays in our culture. While it doesn’t run in everyone’s genes, there are some great local spots that provide the chance to awaken your inner Picasso. Prices vary by night, but they have tons of great offerings in November. There are some great exhibits going up in SWLA and now’s a great time to grab you fiancé and maybe get some ideas for that future home! It’s that time of year! Football is in full swing, basketball is just getting underway and the weather is perfect to be outdoors. Christmas is rapidly approaching and there’s a few date night ideas that will help make you both merry! November is clearly jam packed and that’s just the tip of the iceberg. You can check with the Arts & Humanities Council, The Convention and Visitor’s Bureau and the Central School for more ideas and events. Let us know what fun Date Night Adventures you had this month in the comments below – Happy dating! With the option of a first look becoming more popular, more and more brides want to know whether it really is bad luck to see each other before the wedding. If you are new to the whole wedding scene, you might not have even heard of a “first look,” but chances are you have believed, or do believe, that it is bad luck to see each other before the wedding. It’s not surprising to find out that the soon-to-be-wed couples parents are the number one supporters of hiding out before you walk down the aisle. But you might not be so convinced when you find out where this wedding tradition comes from. Let’s get right to it! The custom of waiting to see each other when you walk down the aisle actually comes from the days of arranged marriages. When marriages were arranged, it was primarily a business transaction between two families, and very common for the bride and groom not to meet each other until they said “I Do.” In fact, the brides veil would cover the her face as well, ya know, just in case the groom decided to hit the road running instead of going through with the deal. Sidenote: This totally makes me think of the story of Jacob, Rachel, and Leah found in Genesis 29 of the Bible. Jacob had actually met both Rachel and her sister Leah previously, but he fell in love with Rachel and agreed with her father, Laban, to work for 7 years to have her hand in marriage. *Swoon* Romantic right? Then the drama comes…..when the big day finally rolls around, Laban sneaks Leah (the eldest daughter) in to consummate the marriage instead of her sister Rachel. Obviously, Jacob was pretty upset about this, but Laban was like “Hey, no biggie finish out your week of marriage festivities with Leah and then you can marry Rachel as well, if you agree to work for me for 7 more years” (which he did of course because he was so smitten). Okay, so what is this “first look” thing? This is that special moment when the bride and groom first see each other in all their wedding day glory. Custom has been that the first look happens when the bride walks down the aisle, which of course has to do with the whole “bad luck to see each other before tradition”. But more and more couples are choosing to select a time to first see each other before the ceremony. What are the pros and cons of seeing each other before the ceremony? Okay, I’m going to be honest. I can not think of any cons except your parents might get upset, or you just might feel very strongly against it. What one might assume to happen, would be that the surprise factor is gone, or your groom might not get as emotional when you do walk down the aisle. But the moment when the bride walks down the aisle really is the emotional climax of a wedding and its hard not to grin and tear up no matter who you are. 9 times out of 10 the groom STILL gets emotional when the bride walks out even if they got to spend some time together before that moment. So the pros: The biggest pro is that you get to spend some quiet time together before all of the wedding activities begin. This is such a big thing! Once the ceremony begins you will officially be swept up into a whirlwind of wedding activities, and depending on how social you and your guests are, you honestly might not get to spend a long amount of time even looking at each other. Spending 30 minutes alone (in the company of your wedding photographer and videographer of course), is such a precious time on such an emotional and exciting day. It’s like a breath of fresh air. All in all, the decision is up to you and your soon-to-be spouse. It’s best to take some time and discuss your preferences as far in advance as you can, since this will help you finalize what your wedding day timeline will look like. To help you discuss this topic, we have included a special download for you to print out and write out your personal pros and cons about first look photos! In the meantime, we’d love to know what your initial thoughts are on the first look and/or waiting to see each other until you walk down the aisle? Let us know in the comments below! Please tell me I am not the only one in shock at how fast this year is flying by? I am blessed to have friends from all over the United States, and it is such a tease to see that they are already posting photos of autumn leaves on social media! All the same, I am so thankful to welcome September this year and hopefully some cooler weather for the Lake Area very soon. As the weather gets a little less warm (or ridiculously hot), we have compiled some great date night adventures for you all to get out and participate in this month! 1. Beginning Watercolor by Theresa Dewey – Okay, I’ll admit I’m an artist at heart so these opportunities to get creative stick out to me! This opportunity in particular sounds like a fun way to get creative with no pressure as local artist, Theresa Dewey, gives a beginning introduction into watercolor. If you aren’t usually an artistic couple, this is a great way to step out of your usual “box” and try something new together! 2. McNeese Faculty/Guest Artists Series: Lina Morita, piano and Lin He, violin – For a relaxing weekday evening date, why don’t you and your favorite someone stop by McNeese to catch a piano and violin performance? I am always so impressed by musicians. I know they spend hours upon hours practicing and perfecting their craft, but it still blows me away to watch them perform in person! This seems like the perfect date to follow up with a dinner date out on the town. 3. Calca-Chew Food Festival – What a great way to get in touch with the French heritage of the Lake Area! The Calca-Chew Food Festival is an alcohol free festival featuring yummy Louisiana favorites like boudin, etouffee, jambalaya, and fried fish, dancing, a live and a silent auction. 4. Sax in the City: Dinner & Concert – This event is another opportunity to enjoy some good music and enjoy dinner out – but this time all in one place! This event will be featuring Grammy-nominated Mickey Huber Smith, Jr. and Lafayette sax-sensation JB Saax and Friends, and it will be a tribute to the elements earth, wind and fire. I can’t wait to see which date night adventures you will be adding to your calendar for September! What other date night adventures do you have planned?